A saying goes, "Love is a many splendid thing. Love lifts us up where we belong." Love can make even the toughest and hardest of hearts mellow, it can turn the wisest into simple fools and emperors to mere imploring souls. 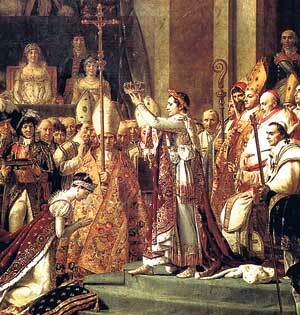 Napoleon Bonaparte, we all know him as the great Emperor of France. Now, a man of such decree we don't imagine to be a compassionate, romantic soul. But it seems otherwise for he had been a true, passionate lover to a hazel eyed beauty named Marie Josèphe Rose Tascher de la Pagerie. Marie Josèphe was born on June 23, 1763 to a white Creole family who owned a sugar plantation. Although the family was once rich, by the time she was born, they were not as prosperous, since a hurricane destroyed their estate in 1766. So, Marie Josèphe was not brought up to meet the standards of the high society of France. But she is lucky and was married to aristocracy - Alexander de Beauharnais. She bears two children with Alexander - Eugène (1781) and Hortense (1783). Marie Josèphe is a fast learner. Although the financial status of her family did not permit her to indulge in mingling with socialites, she learns fast and few years later she becomes one of France's most popular social-butterflies fondly known as Rose. Also, with that comes her habit of spending beyond her means. Her plentiful life soon comes to an end as she and her husband both get arrested during the French revolution. Alexander was executed on July 23, 1794 and she too expects the same fate on herself. But her fate would not have it that way and in July Maximilien Robespierre and his supporters were arrested and executed. Thus The Terror was over and Josephine was released on August 6, 1794, after almost four months in prison. The tale of Josephine and Napoleon's encounter bears many versions. But in all, one character remains mutual - France's leading political figure Paul Barras. Following her return from Prison and reuniting with her children, Paul was one of Josephine's closest friends. But some versions of this story claim that she was his mistress. One thing remains certain - it was Paul Barras that was responsible for the meeting between Napoleon and Marie Josèphe. "Following the riots on the 13th Vendémiaire a law was passed forbidding any private citizen to have weapons in his house. My brother, unable to bear the thought of surrendering the sword that had belonged to his father, hurried off to see General Bonaparte, who at that time was in command of the troops stationed in Paris. He told the General he would kill himself rather than give up the sword. The General, touched by his emotion, granted his request and at the same time asked the name of his mother, saying he would be glad to meet a woman who could inspire her son with such ideals…"
"I awake full of you. Your image and last evening's intoxication have left my senses no repose whatever. Sweet and incomparable Josephine, what a strange effect do you produce upon my heart! Are you vexed? Do I see you sad? Are you troubled? . . . My soul is crushed with grief, and there is no repose for your lover; but is there any the more when, abandoning myself to the profound emotion which masters me, I draw from your lips, from your heart, a flame which consumes me? Ah! It was last night I really understood that your portrait was not you! You are leaving at noon; I shall see you in three hours. Meanwhile, mio dolce amor, a thousand kisses; but do not give me any, for they burn my blood…"